“Good Things Come In Threes” isn’t really a saying but it would be particularly apt for the recent sightings of mini street art sculptures by Three, also known as 3x3x3. One of the curious things about a piece of art by Three is that you spot one, then you don’t notice it the next twenty times you pass by and then it catches your eye again, at which point you wonder if it is a new one or one you had spotted before. After spotting a lovely new specimen in August Three confirmed that this was new and that he was back in the UK – Three is from Hong Kong; and that there were more to find. However, you just can’t go and hunt these tiny concrete accretions and expect to find them, try for yourself, you just drive yourself bonkers spotting small little things on walls and you trot over only to find it is just some random old bit of plastic or something, Three’s sculptures reveal themselves to you when they are ready or when you are sufficiently deserving. We have located three new ones so far, there are definitely more out there. One of the new ones photographed here has sadly already been harvested by a street art thief. C’est la vie. This entry was posted in News and tagged 3x3x3, abstract, architectural, cast concrete, Hong Kong, London, Sculpture, Shoreditch, Street Art, street artist, Three, Tours on 09/18/2018 by Shoreditch Street Art Tours. Shoreditch Street Art Face Off – Gregos is back! French street artist Gregos was spotted back in Shoreditch this weekend in the company of Nemi UHU, the fish tile creator. 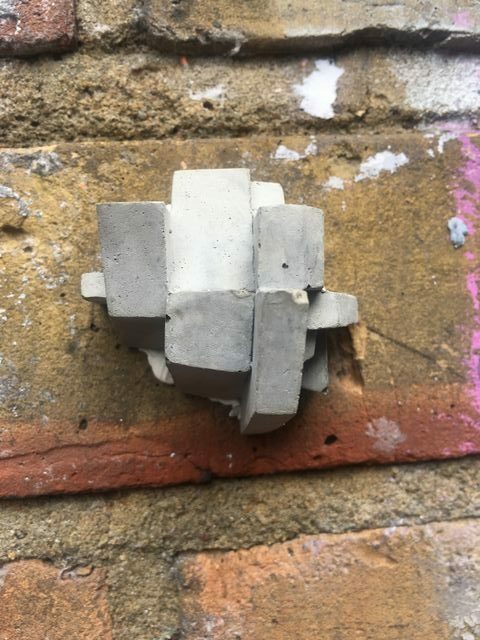 This first came to our attention with the surprise finding of a fat faced portrait sculpture bursting through a wall on Brick Lane last Friday. Gregos first put his work up in London last February when he and a group of 10 other street artists, all friends of C215, came to London to launch “Vitry Ville Street Art: L’aventure continue”, a new book celebrating the art in C215’s home town. He put up 50 self portrait sculptures of varying sizes. There are seven basic portrait castings of Gregos’ own face in a variety of poses, each installation is decorated according to mood, location and whim. The one we saw most of last year was rudely poking its tongue out at the English, that may have been just a happy accident from the French artist’s point of view as this sculpture was created in 2006 when Nicolas Sarkozy was President of France. Gregos was most definitely not a supporter and the rude tongue portrait was designed as a message and personal insult from Gregos to Sarkozy. Gregos’ ambition is to put up another 50 sculptures on this visit so there should be plenty of sculpture spotting opportunities around Shoreditch and Camden where he has been know to visit so far. On Sunday, Gregos installed and painted a new sculpture in Shoreditch providing passersby with a grand spectator sport. Even a cruise-by from the police didn’t stop him. ‘scuze me, has anyone seen Gregos? 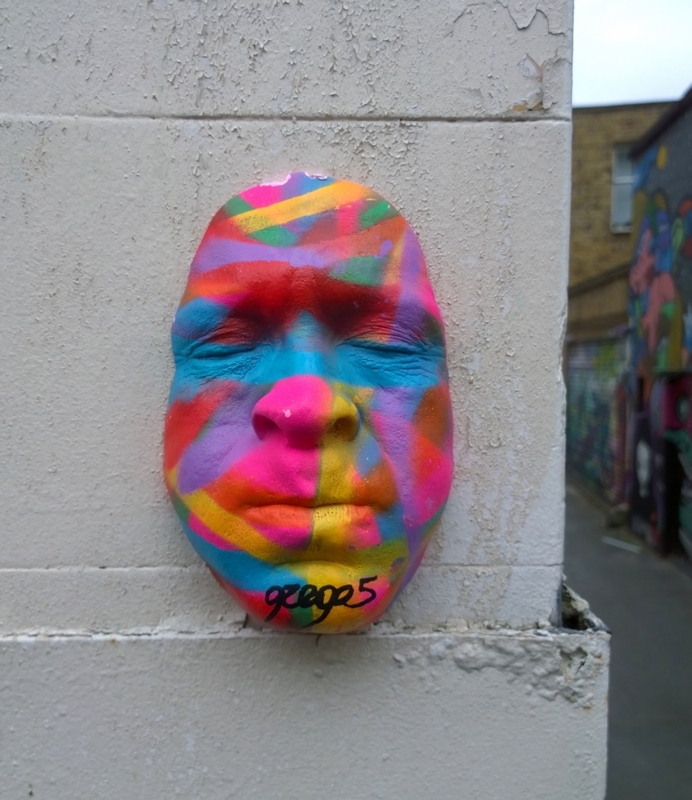 This entry was posted in News and tagged face, French, Gregos, Nemi UHU, portrait, Sculpture on 03/23/2015 by Shoreditch Street Art Tours. The London street artist Sell Out was very busy in Shoreditch on Saturday morning and the Shoreditch Street Art Tour found a variety of his work at various locations. This fountain on Brick Lane has been used as a scene for a number of Sell Out installations, this time a Sell Out Duck floated around while butterflies skirted around its head. There was something about this duck’s stare…..not the kind of duck that hangs around nurseries, kids baths or fairy tale illustrations! Then we found Spiderman scaling this sheer brick wall, the lattice detail was stenciled by Mexican duo Lapiztola but in the close up of Sell Out’s Spiderman, it takes on the appearance of a web. We also found Batman who seemed to be helping the citizens of Shoreditch by handing out Sell Out’s butterflies. 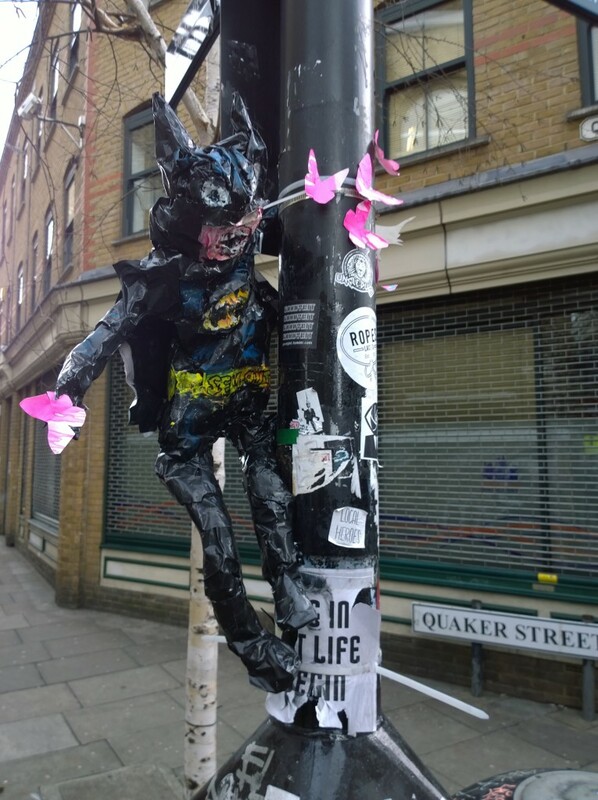 This entry was posted in Artist, News and tagged batman, butterflies, London, Sculpture, Sell Out, Shoreditch, Spiderman, Street Art, street artist, superheroes on 02/23/2015 by Shoreditch Street Art Tours.